We want to share some of the details about The Interval, our public space in San Francisco which opens this Spring. We’ve planned a series of updates that will include an introduction to our Chalkboard Robot, more about Brian Eno’s sound & light installations in the space, documentation of the final construction work, and details on when the doors of The Interval will open, later this year. 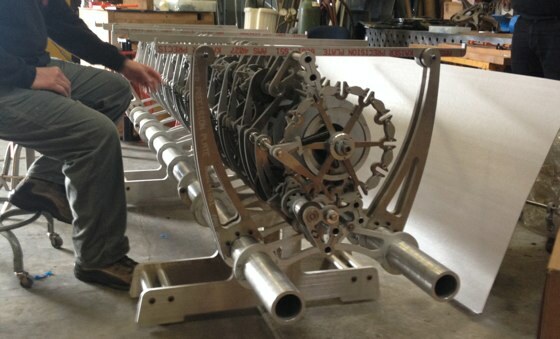 First we’d like to tell you about our Chime Generator Table, which will be a centerpiece at The Interval. 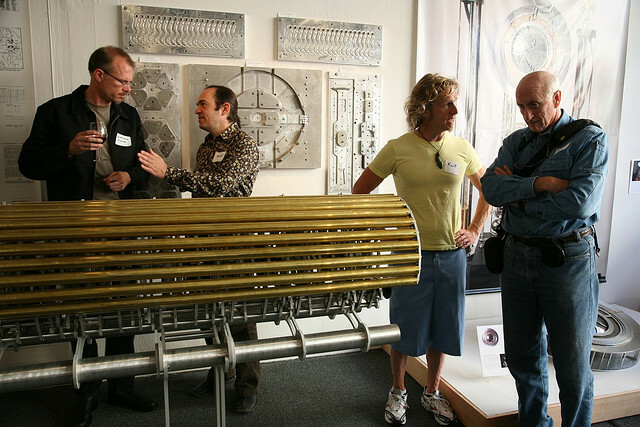 The Chime Generator prototype itself was a much-enjoyed feature at the first incarnation of our public space. This Chime Generator is a prototype at about one tenth the scale of the one that is now being built for the Clock of the Long Now. The mechanism rings a series of ten bells, utilizing an algorithm designed by Long Now Board members Danny Hillis and Brian Eno to vary the order each day for more than 3.5 million permutations in total. This allows our Clock to play a different bell sequence for nearly every day of the next 10,000 years. Learn more about the Chime Mechanism. The prototype was originally designed for us by Paolo Salvagione and Greg Staples, and was built by Christopher Rand. It is made mostly of waterjet aluminum with steel gears, screws, and bearings. Over the years we have used both tubular bells (seen above) and metal “singing bowls” to demonstrate how the Clock will generate its daily song. For its life as a table, we’ve designed around the mechanism itself. While it is not built to last 10,000 years, this prototype did a vital job in proving a concept that we are now using in building the full-sized Clock. Now it has a job to do at The Interval. As a table, the Chime Generator will be both a functioning piece of furniture and a museum artifact. As shown below, it awaits a slab of plate glass which will be placed on top. When you visit The Interval you can set your coffee or cocktail down and gaze into the inner workings of this piece of our Clock design. We hope it inspires as many questions and conversations as it has bell ringing permutations. We have only weeks left to finish our fundraising for this space, and are currently about $100,000 short of our goal. We’re asking for your help: please consider donating to support this project. Any amount you can give brings us closer to the finish line! We have unique gifts to offer our donors, amongst other benefits. As an Interval supporter, you’ll be the first to hear news about the venue, you can suggest books for the Manual for Civilization and vote on other submissions, and best of all, you’ll receive invitations to our special pre-opening parties, the very first events at The Interval! Here’s one more shot of the Chime Generator, this time with singing bowls attached, from the Anathem release event in 02008. 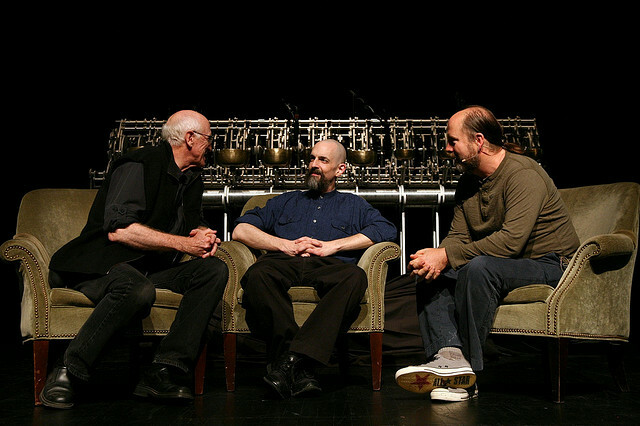 It shared the stage with Long Now co-founders Stewart Brand and Danny Hillis, as well as Anathem author Neal Stephenson, who is himself a donor to our Interval ‘brickstarter’.